Game Information: Playtech created what would become one of the biggest themed progressive jackpot games of all time, The Incredible Hulk. Playtech partnered with Marvel Comics and released this comic book-inspired progressive jackpot in 2008 and the game has gone on to produce quite a few instant millionaires since. The Incredible Hulk character is one of Marvel Comics most beloved characters and has been a firm favourite with fans since the early sixties. The character has graced a number of adventures and formats including comic books, movies and, a progressive jackpot slot. Let’s take a closer look at what this Playtech slot has to offer. The Incredible Hulk features a wild symbol that can substitute for other symbols to make better and faster winning combinations. Not only is this convenient to making winning easier, the wild can be transformed into an expanding wild, and that is where the real fun is! The Incredible Hulk is fairly unique in that, if you manage to get three wilds on reels 2, 3 and 4 (anywhere on those reels) they combine and transform into a single massive wild which then pays out all possible winning combinations. This could potentially net you an incredible pay day in one single spin. 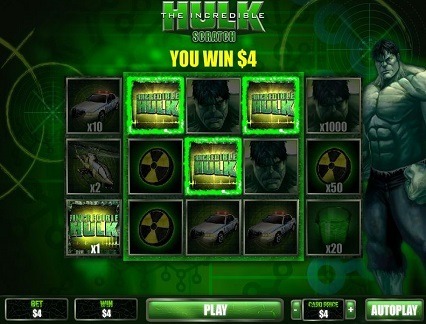 The Incredible Hulk also offers players the opportunity to further enhance their bottom line with a few free spins. The game features a scatter symbol which is represented by the Incredible Hulk logo and getting three or more of these symbols anywhere across the 5 reels will trigger a free spins round. The free spins round offers a total of 10 free spins which are further enhanced with an x3 multiplier and this round can be retriggered with no limits to the amount of retrigger times. 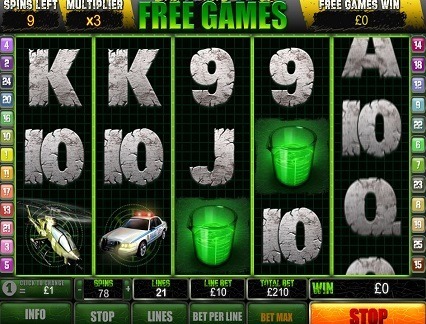 This could potentially net you a small fortune, just in the bonus free spins round alone. The Incredible Hulk Bonus round is triggered by the games second scatter symbol which is represented by the Smash Bonus symbol. Again, getting three or more of these anywhere across the reels will trigger the bonus round. In this bonus round we are taken to a separate screen in which Hulk is cornered by the local police force. The idea behind this bonus round is not only potentially very lucrative, it is also incredibly fu as Hulk has to smash his way out of the situation. There are three helicopters as well as seven different cars in total and you get to smash one helicopter and four of the cars. The smashed cars reveal different amounts of cash money while the helicopter determines your multiplier for the round. The Incredible Hulk is action packed and moves at a fast, Hulk-like pace. The graphics are excellent and the predominant colour scheme is, you guessed it, green! The game features plenty of imagery and scenes from the 2008 blockbuster movie and is clearly meant to compete with Microgaming’s Dark Knight progressive jackpot game. One of the coolest features is the games sounds which include the Hulk’s awe-inspiring roar along with crashes, bangs and booms as the green giant smashes his way through the game. 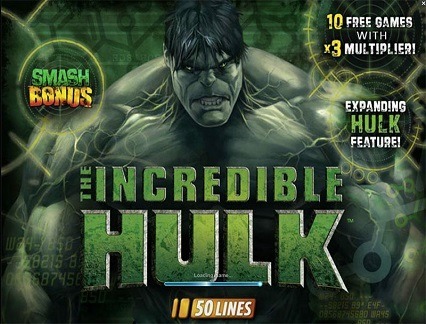 The Incredible Hulk is a Playtech Marvel progressive game and as such forms part of Playtech’s highly successful Marvel Multi-level Mystery Progressive Network. The game offers a total of four different progressive jackpots which are all randomly triggered at any time during the game. The progressive jackpot round offers players a grid of 20 different squares and players choose until three squares are matched. The three matched squares determines the progressive jackpot level that has been achieved. The Incredible Hulk is a high volatility progressive jackpot and one of the highest pay outs amounts to date was recorded in 2011 when a lucky spinner walked away with $1.3 million. Another lucky player managed a total of $885,000 in 2012.